Pinnacle Starter Kit for Cyclo Polishers is a two step swirl remover kit. Includes Pinnacle Advanced Swirl Remover and Finishing Polish. Eight Cyclo Premium Pads are washable and reusable. The Pinnacle Starter Kit for Cyclo Polishers gives you the essential tools to restore a flawless shine to your vehicle using a Cyclo Polisher. This kit works with both the original Cyclo and the Cyclo 5-Pro. Use this kit on all types of paint to remove swirls and imperfections and restore a brilliant gloss. Pinnacle Advanced Swirl Remover brings �user-friendly� to a whole new level! Diminishing abrasives and water-based lubricants blend away imperfections gradually, leaving a smooth paint surface. This tempered approach to polishing eliminates imperfections while being extremely gentle on the paint. Pinnacle�s diminishing abrasives are tempered to break down slowly and evenly under the motion of the oscillating pad. An orbital polisher provides just the right motion and friction to maximize the performance and working time of these abrasives. This approach softens the abrasives� impact on the paint, which ultimately preserves more of the paint. 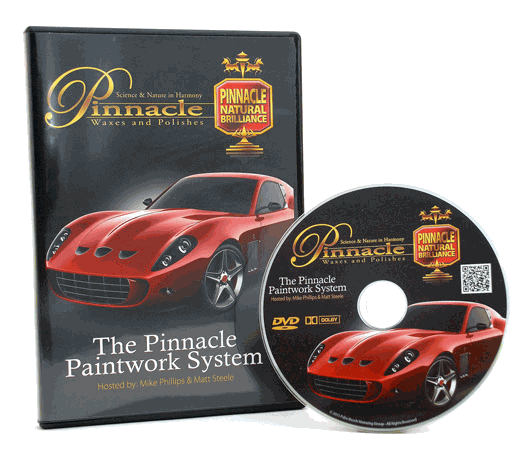 If you have a newer vehicle or meticulously maintained paint, Pinnacle Advanced Swirl Remover is for you. 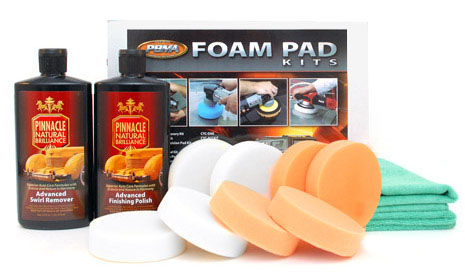 The orange pad is the all-around swirl remover, polisher, and paint deoxidizer. Made of high density foam, this pad will correct most mild to moderate paint imperfections and polish metal and chrome. Bring out a beautiful shine on any paint finish with a pair of white finishing pads. The thick pads are made of professional grade closed cell foam. Each have hook & loop on the backside so you can switch out pads in seconds. The white pad is the softest of all the Cyclo brand pads and it has no cutting ability. Use it for finishing glazes and wax application. Constructed of the finest quality microfiber, the Detailing Towel sets the standard with an outstanding 80/20 blend of polyester/polyamide filament, woven so densely they boast over 200,000 strands of fiber per square inch of fabric! These strands are nearly invisible to the naked eye, and are 100 times smaller than a human hair! Use this cloth for cleaning, buffing, and wiping away wax. A total retail value of $128.94. Save $28.95! McKee’s 37 Polishing Pad Rejuvenator 16 oz.